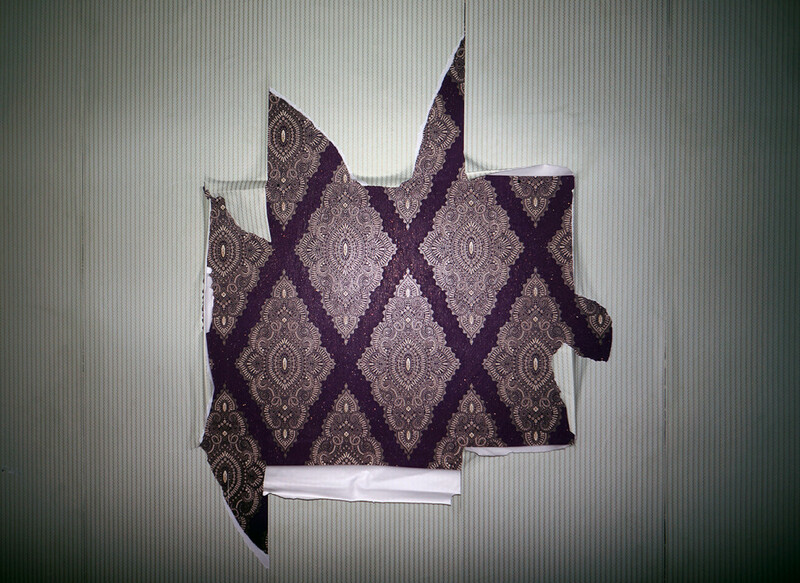 Is a separate room, imitating the former living room, papered, and now abandoned. Оn the left imaginary “owner” signs, visitors can easily reconstructs interior and paintings on the walls. The last show themselves as traces in form of holes on wall, revealing next layer, is already a different color. Absurdity of the simulated situation (paintings were covered with Wallpaper, and then pulled out under them) not right away, but overturns the perception of installation. After it becomes apparent conventionality “reality” of this room, the work becomes a statement on purely artistic theme – relations background and figures. In this case, the figure (a mental picture) is given as a negative reception in her absence. In its turn, background doubled the first and second upholstery layers. Theme of the Wallpaper is not accidental. Frequent motive of Elagin – different digital patterns. For example, it can be screensavers. As materialization of such patterns artist took wallpaper, which essentially was for people of the same “screensaver” was for people the same “screensaver” long before advent of electronic technologies. Surrounding himself with ornamentation, people shows initial fear of emptiness of the surrounding space, which looks more comfortable, when filled similar images. Freezes, crashes and other violations whole digital images in the aesthetics of Elagin present own visual value. Rupture of wallpapers, are the same “gap”, and they become independent “shape”. Break lines are transformed into the frame, separating them from “background”. The background is evenly filled with visual patterns, can also be viewed as a “picture” – says artist.